A 90º staircase has a left or right turn. 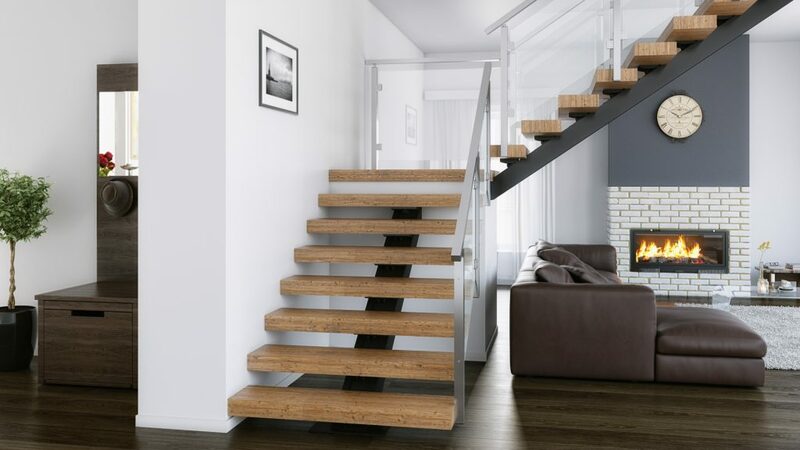 It’s often used to save space in homes where a straight staircase would interfere with the living space. The 90º stairs mono-stringer runs beneath both sections of treads. The upper stringer connects to the landing, and the lower stringer (often a smaller, specially cut steel stringer) connects to the landing as well. 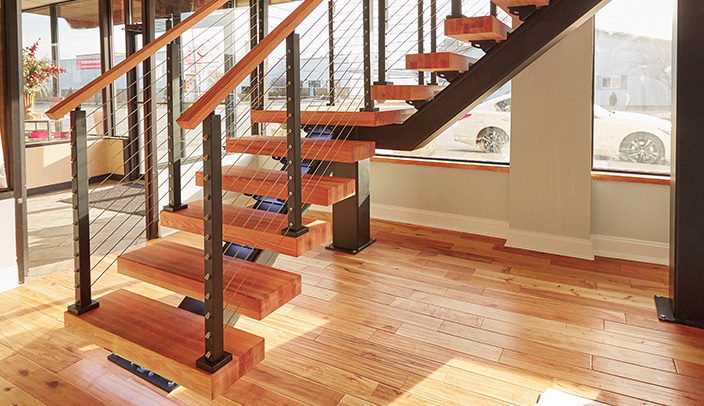 Discover the benefits of a mechanical and welded floating stair systems. What is a Metal Stair Stringer? Want to know what all a metal stair stringer involves, check out this page for more information. Yes. We manufacture each section of your staircase and ship it to you clearly marked and labeled— to ensure quick assembly on site. You’ll receive your straight stair in one piece, and all the tread brackets will come with bolts, so it’s simple to bolt the entire system together. Can Viewrail staircases be built to code? All Viewrail staircase components are built to comply with the most recent iteration of the International Builders Code (IBC). We always recommend that you check on your state or local laws to ensure that you are complying with their individual requirements for installation. What type of steel are your indoor stringers made from? Our interior stringers are made of mild steel. We chose this material for its strength and durability. It’s perfect to hold up to the everyday wear and tear of home life. Can I add a riser? Yes! We even have a glass option. This pairs exceptionally well with our glass system. Will I need other people to help install the stringer? Most likely yes, unless you have the right equipment. However, a small team will always help speed up the process of installing a straight stair. Here is a video of a father and son installing an entire project from start to finish! How much weight can your stringers hold? Our steel stringers have passed the building code guidelines and this was determined by an independent third-party engineering firm. In fact, a straight stair can hold over 10,000 pounds of weight. Our founder, Len Morris, actually tested this out himself in a live Facebook video. A simple straight stringer that’s perfect for your modern home. Click here for more information. Need a Switchback Stairs for your home? 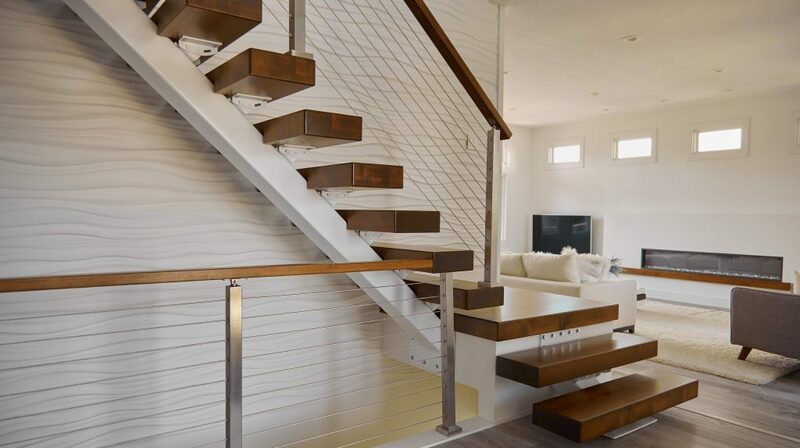 Learn more to find out if this modern staircase is right for your home.